Building trust takes time. 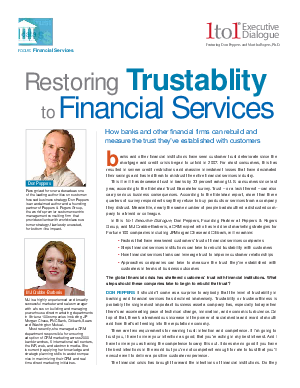 And when trust has been damaged, whether by real or perceived actions, companies must work harder and smarter to ensure they are taking every possible action to continually enhance the customer's trust. In this 1to1 Executive Dialogue, Don Peppers, Founding Partner at Peppers & Rogers Group, and MJ Crabbe-Barberis, a CRM expert who has led direct marketing strategies for Fortune 100 companies including JPMorgan Chase and Citibank, discuss trustability within the financial services sector.